By the 1860s, in Manitoba, the increasingly crowded settlements along the rivers were forcing people to venture out onto the open prairies for better farming opportunities. One of the first such areas opened was the Victoria district, near present-day Stonewall. The first minister here, Reverend Samuel Matheson, began raising funds in 1876 and by 1877 an Anglican Church was completed. 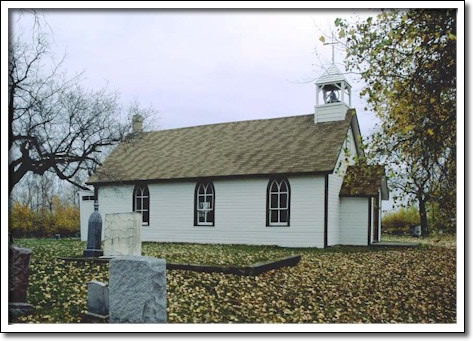 All Saints is an early example of dovetail log construction, a building technology that was replacing the more familiar Red River frame technique employed throughout the West until that time. After his service at All Saints, Reverend Matheson went on to become Canon of St. John’s Cathedral, Professor of Theology at St. John’s College, Archbishop of Rupert’s Land and, in 1909, Primate of All Canada. Archbishop Matheson returned to All Saints Victoria on October 9, 1927 to conduct the church’s 50th anniversary service.